There is just something about when I get to turn the calendar month to September and the temps begin to drop and the leaves start to turn beautiful colors that makes me soooo excited to cook anything that screams fall. 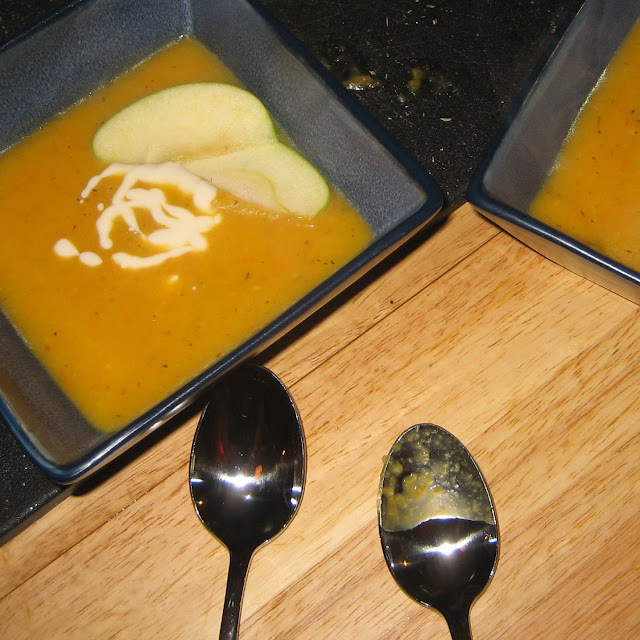 One Sunday evening, that anything became Butternut Squash and Apple Soup. I will admit, I am not really a huge soup person. I enjoy making it more than eating it most of the time. But there is something about butternut squash that changes my mind, and this soup will confirm that. Being somewhat thrifty as well supports my decision to make soups like this. They are easy to freeze in one or two portion servings and just reheat over the next few weeks. Melt butter in a large, heavy pan set over medium-high heat. When hot, add squash, leeks, carrots, and celery and saute, stirring frequently, until vegetables have softened slightly, 10 to 12 minutes. Add apples, thyme and sage. Add stock and 1 cup of the cider. Bring mixture to a simmer. Reduce heat, cover and simmer gently until vegetables and apples are tender, stirring occasionaly, for about 30 minutes. Remove from heat and cool slightly. Blend soup in batches in food processor or blender and return to the pot (or immersion blender in the pot). Taste soup and seaons with salt as needed. Serve with cider cream and thinly sliced apple.